It has been a very mild, nay warm, few days. Everything is still growing and the clock is ticking until the first frost hits. So yesterday I gave the lawns a November cut. The grass has been growing strongly since the rain returned in September and it was too straggly to leave. 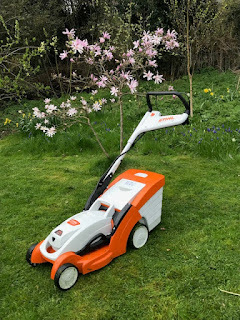 I wondered if it was the latest I had cut the lawn, but a quick check in my garden journal showed me that I had cut the lawn on the 16th November last year. The Side Lawn in the front garden is mossy and weedy and waiting to erupt into a sea of aconites and crocii. I am really keeping my fingerscrossed about the winter aconites I planted out in this lawn this Spring. If even one flowers I will see it as a success. In the back garden the Long Shoot is probably the shape \I want it to be. The Pond Border is on the right, the Coal Bunker Border on the left and the Conservatory Border sweeps around the top. I encourage daisies to grow in this lawn and this year there have been quite a few. I do love a daisyed lawn. Up the other side of the Pond Border there are the four sisters. There are some snowdrops bought from Easton Walled Gardens in the centre of the sisters' lawn. I live in hope that they will multiply eventually. Further on up to the Dancing Lawn, which will be a sea of crocii and Narcissus cyclamineus in the Spring. It will, a veritable ocean! Well, a few anyway. The grass in the Wild Garden is more scraggy. It does not get cut very often in the year as usually I let it grow long. 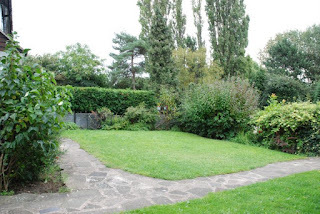 For next year I am thinking of cutting it differently, more open space, less narrow paths. This is thought in progress. There are many Spring bulbs planted through this area, every year a few more snowdrops go in, daffodils, species tulips and now some muscari as well. At the very top of the garden in the borderlands there is even scraggier grass. This part of the garden suffered greatly from the tree issues in the year. I want to reduce the amount of cow parsley that grows in this area. Even as I say this I can see the tufts of it coming up again for the Spring. I was getting mower-happy as I went around the garden and even mowed the grassy knoll. This rarely gets cut, I sometimes attack it with some shears but I like to let it grow. I think it is good to let it grow as every summer it now attracts grasshoppers and I would not want them to be discouraged. I love the curve of the lawns as I look down across the Bermuda Triangle and down into the formal bowl of the Long Shoot. This shaping of the lawns and borders still makes me very happy. It has worked as I wanted and even though the border extensions created last Autumn still need further planting up, I think they have added positively to the development of the garden. Despite the fact I have just shown you lots of pictures of grass, I am not really a great lover of the stuff. It sort of grows and sits there most of the time which is why I plant things through it. I do remove the odd weed, but not fanatically. I rarely rake it and have never aerated it, though I sometimes think about doing it. It is best described as neglected. Yet I do think its role as acting as a calming green foil of the rest of the garden is important and earns it its place. Lawns are probably the most high maintenance plants you can grow and mine nags at me to be mowed throughout the growing season. So I am hoping the November cut is the last cut of this year. I look forward to a few months mowing rest and bulb emergence.